The city of Fukuoka is one of the main tourist destinations in southern Japan, and it is listed among Japan’s ten most populous cities. 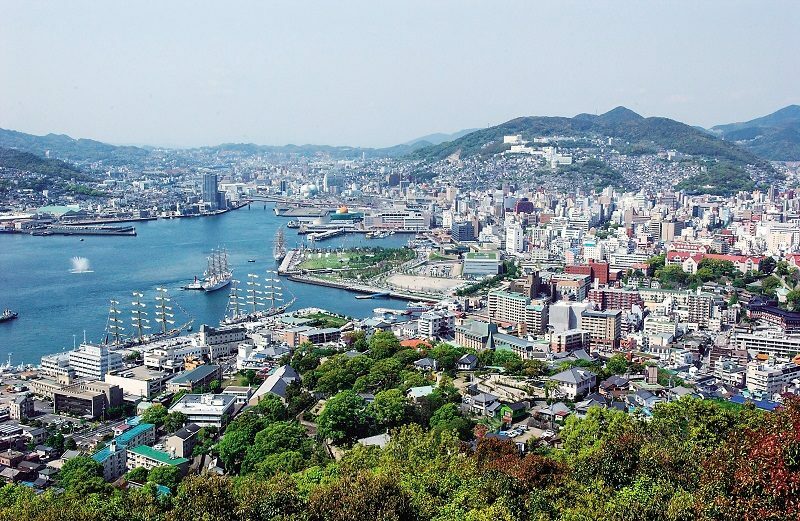 It is the largest city on the island of Kyushu, and packed with amazing travel experiences. Whatever you’re looking for in your next Japanese vacation, Fukuoka is likely to deliver. The city is home to traditional parks and temples, massive shopping complexes, modern cityscapes, and special offerings for the food enthusiast. There are also a number of day trips from the city made possible using the Shinkansen bullet trains, and its southern, warmer weather is loved by the Japanese. Consider this helpful Fukuoka travel guide when planning your next vacation. You’ll discover interesting things to do as well as helpful tips on getting to and around the city. You’ve got your Japan Rail Pass in hand and you’re ready to use it to travel affordably across Japan. Thanks to the Shinkansen bullet train lines that service Fukuoka’s Hakata Station, doing so is easy. If traveling from Japan’s metropolitan hub of Tokyo to Fukuoka, take the Tokaido/Sanyo Shinkansen train from Tokyo to Shin-Osaka Station, where you will transfer trains before continuing to Hakata Station. In order to use your JR Pass, you will ride either the Sakura or Hikari trains. You may wonder, how far is Fukuoka from Tokyo? 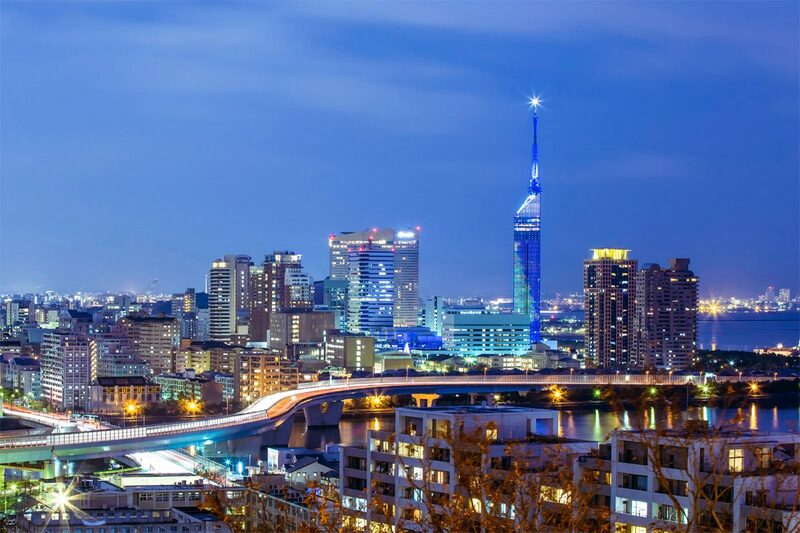 Tokyo is located on the main island of Honshu, while Fukuoka is on the southwestern island of Kyushu. This trip of approximately 1,000km is one of the longest train trips you can make in Japan. The Shinkansen trains actually pass through an undersea tunnel between the islands, and the entire trip takes about six hours. If you are traveling from Kyoto or Osaka to Fukuoka, you will likewise take the Sakura train on the Sanyo Shinkansen line, departing from Kyoto Station or Shin-Osaka Station and arriving at Hakata Station. This trip entails about 2 hours and 30 minutes of travel time from Osaka and 2 hours 45 minutes from Kyoto, passing by Hiroshima Station, which is two hours from Fukuoka. This train is also covered by the JR Pass. Once you arrive at the newly renovated Hakata Station, you will enjoy shopping, dining, and a thriving nightlife within the station itself. Also, remember that you can activate your Japan Rail Pass and make any seat reservations and train changes in Hakata Station. To continue your journey throughout Kyushu, you can travel quickly and comfortably using the Kyushu Shinkansen. This bullet train allows rapid travel to Kumamoto, Kagoshima, Beppu, and Nagasaki. Additional service areas will be opening for the line in 2023. Also, JR Limited Express trains are available from Hakata Station, including the Kamome to Nagasaki, the Yufuin no Mori to Oita’s Yufuin Hot Springs, and the Ariake to Kumamoto. The Sonic Limited Express connects with Beppu and is also covered by the JR Pass. The expansion of the West Kyushu Shinkansen will connect Fukuoka and Nagasaki directly. If you are looking for a unique way to see the island of Kyushu, the luxurious Seven Stars Kyushu might be just the ticket. This train departs from Fukuoka on trips of four days and three nights or two days and one night. Fukuoka train services are also provided by several non-JR lines, including Nishitetsu Railways and three different subway lines. Some of the subway lines – such as the Kuko subway line – connect with Hakata Station, but the Nishitetsu trains utilize Tenjin Station. The Kuko subway also delivers direct, ten minute transportation to the Fukuoka Airport. Main train stations are also connected by the 100 Yen Bus, which, as its name suggests, offers loop rides through the city center and various attractions for only ¥100. Fukuoka is famous for its open air food stands, called yatai. Over 150 food stands are spread across the city, each seating six to eight people for an outdoor dining experience. Some of the best yatai are located on Nakasu Island. Twenty or more yatai are grouped together, enjoying a scenic waterside view. Common offerings include skewered meats (yakitori), Hakata Ramen soup, and alcoholic beverages. The stands are typically open from 6 pm to 2 am each day. In addition to the shopping available at Hakata Station, another popular destination is the “city within the city” known as Canal City Hakata. An open-air canal runs through the complex, with water shows every thirty minutes. Visitors will enjoy international brands, shops exclusive to Japan, a theater, hotels, gaming, and restaurants. Finally, the history buff will delight to pay a visit to the Fukuoka castle ruins. Once the largest castle in Kyushu, it was torn down in the late 1800’s. Foundations of many structures whisper of its former glory. The park is laced with walking trails and is an excellent spot for viewing cherry blossoms in early spring. Next to it is Ohori Park, a registered Place of Scenic Beauty with a magnificent pond. 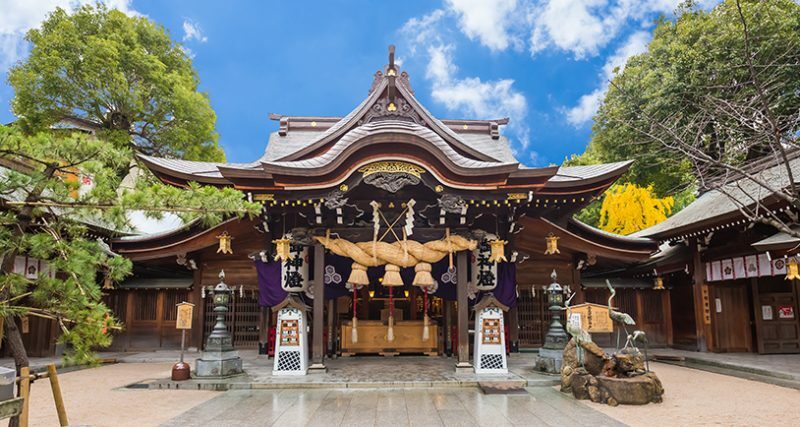 And if you are looking for a traditional temple, make sure to visit Kushida Shrine, just 15 minutes by foot from Hakata Station. Founded in 757, it is the home of the Hakata Gion Yamakasa Festival, which is held every year during the first half of July. Whatever activities you choose, you are certain to be pleased with your experience in Fukuoka. Don’t forget to check out our other insightful travel guides, spanning locations across the nation of Japan. We are planning to travel from Fukuoka to Tokyo . can i use a JR pass for these travel? Hi Jun! Yes – indeed for your itinerary the Japan Rail Pass is the most cost effective ticket. Fukuoka to Tokyo is actually one of the longest train trips you can make in Japan and thus savigns are huge. Happy travels! hi. can we travel from fukoka to osaka via the Sakura train? Will they honor the JRP? Hi Maria! As detailed in this article, Sakura train on the Sanyo Shinkansen line, departing from Kyoto Station or Shin-Osaka Station and arriving at Hakata Station, is fully covered by the Japan Rail Pass. Happy travels! hi, we are traveling to fukuoka this april 19-25. we plan to visit hiroshima for a whole day and return back to fukuoka and then travel again to nagasaki from fukuoka. is there a pass which i can use for both? – Hiroshima is 2 hours from Fukuoka. To get there he Sakura train on the Sanyo Shinkansen line, departing from Hakata Station. – The Kyushu Shinkansen allows rapid travel to Nagasaki from Fukuoka. May i know the Sugomon Pass available on End of Apr 2019 ? Could i use the above pass to Nagoya or Tokyo ? please help. May I know can i use JR pass for the subway in Fukuoka? Hi Citrine! Fukuoka metro is not included in the Japan Rail Pass. Happy travels! how to go fukuoka from osaka ? by train – any pass ? by flight – which airline ? As stated in this article, if traveling from Osaka to Fukuoka, you will likewise take the Sakura train on the Sanyo Shinkansen line, departing from Shin-Osaka Station and arriving at Hakata Station. This train is included in the Japan Rail Pass among other passes, for instance.